-The muscles begin to relax and gradually stretch, along with ligaments around the spine. -The intervertebral space expands, which brings blood flow, circulation, and nutrition to the areas which were being compressed. -Increased circulation helps to oxygenate muscles, nerves, tendons, and ligaments, which leads to decreased pain and increased mobility. -Pinched nerves are released. Herniated and bulging discs reduce. Pressure is relieved. ❤️STAND 250LBS OF PRESSURE-We have tested our neck traction for 100 times, it proved that the sturdy hanging buckle could support 250lbs,never be afraid sapping or injury. 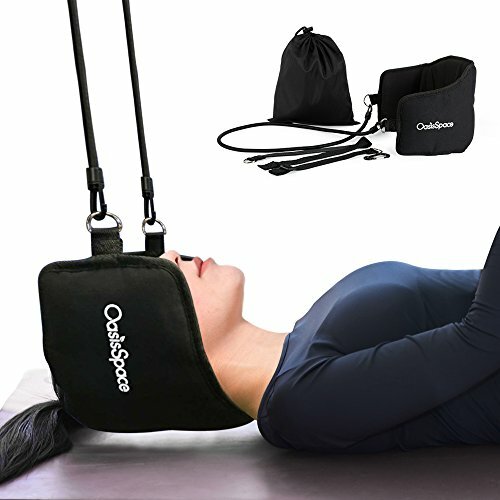 ❤️ RELIEF IN MINUTES - Safe and effective soothing neck and shoulder pain,Enhance neck flexibility,helps alleviates tension, increases relaxation, and promotes healing. ❤️ AFFORDABLE, PROFESSIONAL GRADE RELIEF - Made of super soft hand-washed fabric,.It is 100% safe and ultra-comfortable use and the support is about 1.6 inches thickness. Lightweight, and portable so you can take it anywhere. ❤️ WHAT YOU GET：1× Cervical Traction Device, 1×Carry Pouch, 1×Instructions.Weight: 305g, Size:53*19cm. Hand washable,Can be reused. ❤ 100% Service Guarantee - Better Neck Pain Relief at Your Door. We Offer A 100% Guaranteed Refund.